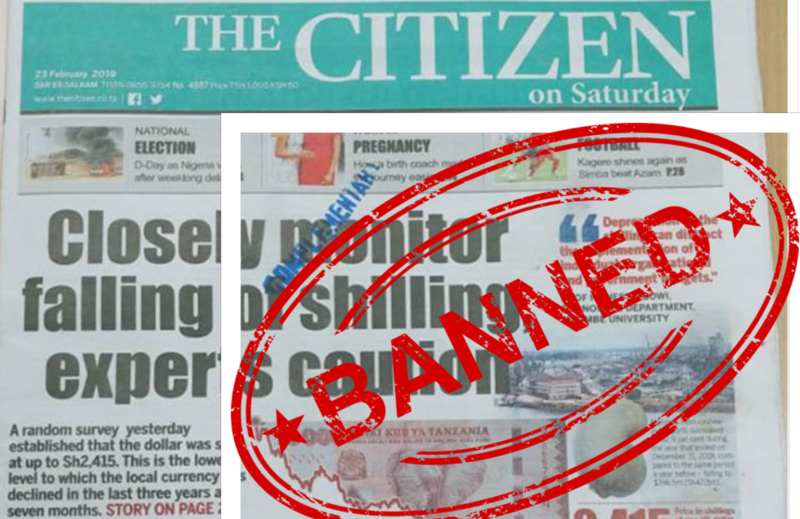 DAR ES SALAAM – Tanzanian authorities have banned the publication of The Citizen newspaper with officials accusing it of running a “false” story on fall of the country’s shilling against the dollar. On its website, the newspaper said the move came after it ran a story urging authorities to closely monitor the fall of the Tanzanian shilling against the greenback. The ban took effect on Wednesday, February 27, running for seven days. According to Daily Nation, its Kenyan-based sister publication, The Citizen was accused of publishing false information in the story on February 23. Mwananchi Communications is owned by Nation Media Group (NMG), which is the biggest media company in East Africa. In its report, The Citizen quoted a random survey of foreign exchange bureaus in Dar es Salaam, the country’s commercial capital, which indicated one US dollar was going for Tsh 2,415. On the other hand, commercial banks were quoting one dollar at Tsh 2,436 up from Tsh 2,238 at the end of last week. It quoted experts as warning the trend may mean Tanzanians will be forced to dig deeper into their pockets due to the increased cost of importing goods. Since coming to power, President John Magufuli had shut down several newspapers and radio stations and imposed restrictive media laws. Several journalists have since been arrested. Last year, the government banned four newspapers, Mawio, Mwanahalisi, Raia Mwema and Tanzania Daima on trivial faults.